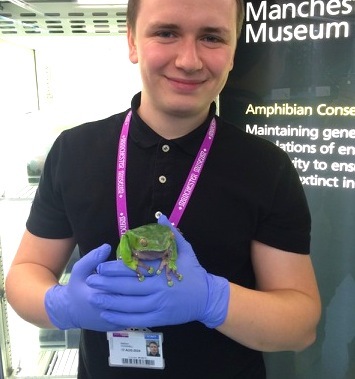 Hi, my name is Matthew O’Donnell and I joined the Vivarium as Curatorial Assistant in August 2014. I’m very proud to be able to post on the Frog Blog, a blog I’ve followed for a number of years and I hope you will enjoy finding out more about me and what I’ve been up to through my future posts. It is a great honour for me to be able to work with such talented and experience individuals, not to mention the unique and wonderful collection of reptiles and amphibians that the vivarium maintains. I am a graduate of Zoology from the University of Salford with 15 years’ experience working with reptiles and amphibians first as a hobbyist and more recently in a professional capacity. Having grown up in Manchester some of my first encounters with exotic species of reptiles and amphibians were at the Vivarium in Manchester Museum, I was lucky to have such a fantastic resource on my doorstep and I know first-hand the influence such an establishment can have on the development and nurturing of a love of the natural world. It was this love of the natural world and specifically reptiles and amphibians that resulted in me choosing a career path that would allow me to work closely with these groups of animals. My visit to Nordens Ark, Sweden, January 2015. This January I was incredibly fortunate to get the opportunity to visit our colleagues in Nordens Ark – Sweden, as part of a skill exchanging exercise. I spent a week with the amphibian and reptile team from whom I learnt a great deal, and hopefully passed on some of my knowledge at the same time. For those who are not aware of the work of Nordens Ark I strongly recommend that you follow the links on this blog to their site, the conservation work they do is fantastic and the facility itself is first class. Opportunities such as this are a great way of sharing experience and skills between staff and organisations and can only benefit all those involved, I feel I have not only developed as a reptile and amphibian keeper but also as an individual. Everybody was so welcoming and helpful during my visit that I could not possibly thank them all but I would like to express my gratitude to all those who helped facilitate my trip especially; Claes, Jimmy, Kristofer, Emma and Sandra. I would also like to thank the Museum and Andrew for showing their faith in me through investing in this trip so soon after I have joined the team. You may be relieved to know that not all the reptiles and amphibians at Nordens Ark are currently hibernating! They also have a nice collection of tropical species found in the wetland house and in the separate breeding facility. In this video you can see a few of those species, including the critically endangered Mountain Chicken (Leptodactylus fallax) and Roti Island snake neck turtle (Chelodina mccordi). Whilst I might be primarily focused on amphibians, reptiles and invertebrates in my work at the museum, I still have a fondness for mammals and in particular carnivores. So whilst I was visiting Nordens Ark I was fortunate enough to get up close and personal with a few of the species that they keep there. I would like to say a special thank you to Camilla who works on the carnivore and ungulate section, who very kindly agreed to let me shadow her one morning. In this video you can see me and Camilla feeding the Eurasian Lynx (Lynx lynx) and Wolverines (Gulo gulo)! What a great experience! I also had the opportunity to get up close and personal with the Red Panda (Ailurus fulgens) whilst the vets carried out a routine procedure, what a fascinating animal! Really enjoyed the talk on Project Lemur Frog today! Thank you! We went straight up to the vivarium afterwards. Brilliant! You asked for suggestions for future events. We would love to find out about how garden ponds and other features in gardens support wildlife. We have frogs in our garden but would love to have newts! We will keep our eyes open for news of the next event at the end of Feb.